In 1902, Nicola Catena, an Italian immigrant, planted his first vineyard in Mendoza, Argentina. The winery has remained under family control — now in its fourth generation — and is one of the few family-owned wine companies in Argentina that remains in Argentine hands. Owned today by Nicolás Catena and his daughter Laura, Bodega Catena Zapata is known as the pioneer of fine wine from Argentina, and Nicolás is recognized as the vintner who revolutionized wine quality in Argentina. A trained economist, Nicolás began this revolution in the early 1980s and continues to challenge himself and his team to make wines that can be counted among the best in the world. His measured approach to viticulture has taken its place in wine history as the pioneer of Malbec and high-altitude viticulture. Catena wines, first launched in 1992, set a new standard for quality in South America. The wines immediately proved the quality potential of Argentina and garnered the first outstanding reviews for Argentine wines from worldwide media. After more than 20 years, the wines of Catena continue to lead the way in Argentine viticulture and winemaking. The family and the winery’s employees take great pride in carrying on the tradition that began over a century ago. 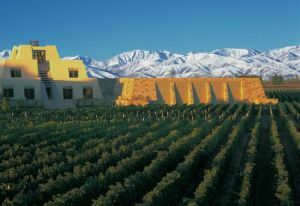 The Catena family’s estate vineyards are located in the premier growing regions of Villa Bastías, Tupungato; Agrelo, Lujan de Cuyo; Lunlunta, Maipu; Gualtallary, Tupungato and La Consulta, San Carlos. Nicolás believes the terroir of Mendoza's high altitude wine country (3,000 - 5,000 feet above sea level) is unique to the world, and the reality of this belief is expressed in every bottle of Catena wine crafted. Catena Classic - The Catena wines are made from 100% estate-grown fruit from the Catena family’s high-altitude vineyards. These wines are a blend of single varietals from various locations within these vineyard sites. Each vineyard is farmed in preparation for its role in the final blend, and each is harvested and vinified separately in order to preserve the unique expression, aromas and flavors of the fruit. This ultimately brings to the blend the strengths of each vineyard, adding a heightened complexity to the final wine. Catena Alta - In the early 1990s, the Catena Alta wines set new standards for Argentine wine internationally, paving the way for a new category of high-end wines from Argentina. With these wines, Bodega Catena Zapata continued their pioneering efforts being the first to release Malbec, Cabernet Sauvignon and Chardonnay of this quality from Mendoza’s high-altitude wine country. It is a truth among viticulturalists that every vineyard has a sweet spot: a series of rows, known as a lot, that produce better quality fruit. Differences in soil structure, clonal selection, row orientation, slope or plantation density result in a mix of wine character and concentration that gives the barrels from these rows a one-of-a-kind personality. The Catenas have spent the last 25 years extensively mapping their estate vineyards in order to discover these lots. The discovery and meticulous nurturing of these special rows gave birth to the Catena Alta wines. Each lot is farmed and vinified separately in order to showcase its unique expression. When brought together, each adds an individual element to the overall complexity of the final wine. Catena Alta is made from a limited production of single varietal wines from historic rows, or lots, in the Catena family’s high-altitude estate vineyards.